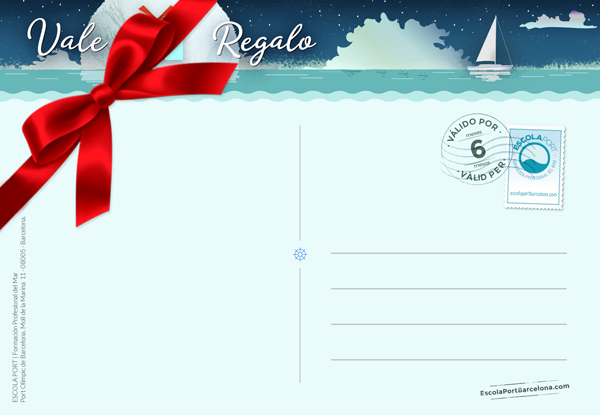 The gift voucher of Escola Port is an ideal gift for any nautical fan. With your gift voucher, with just € 80, the possibilities are almost endless. WHAT CAN I GIVE WITH THE ESCOLA PORT’s GIFT VOUCHER? THE GIFT VOUCHER CAN BE REDEEMED FOR A NAVIGATION LICENSE COURSE OR USE IT AS A DISCOUNT IN ANY OF OUR COURSES, PRACTICES OR ACTIVITIES. Complete a full Navigation License course. Discount 80 € on the final price of any recreational course. PER · PNB · PMN · PY · CY. Applicable on the current offer price when making the exchange. Anticipate € 80 for the enrollment of any professional training course. Discount 80 € in the price of any mandatory or complementary practice. A 30-minute tour on a jet ski for two. Departure from the Olympic Port. Rent a practice boat with instructor for 3 hours. Along with 4 other participants who have registered for that session. Make two trips with the sailing club. HOW DOES THE ESCOLA PORT’s GIFT VOUCHER WORKS? When you buy your gift voucher you will receive a PDF file that you can personalize and give away. To validate it, you just have to contact Escola Port and decide when to use it during 2019. Remember to indicate the order number on your gift voucher!